- Sari Colt on 三月 18, 2016. 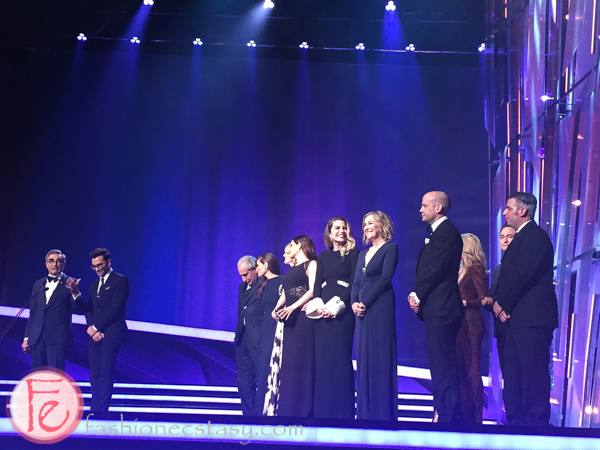 The Academy of Canadian Cinema and Television hosted the Canadian Screen Awards 2016 during the Canadian Screen Week from March 7th to March 13th. The week included events like the CSA Television and Digital Media Galas 1 and 2, Academy Talks, #AcademySocial, Behind the Screens Industry Forum, Fanzone Meet the Stars Event and the two-hour live broadcast of Canadian Screen Awards Gala 3. The awards started in 1949 as the Canadian Film Awards and later became the Genie Awards (film) and Gemini Awards (television). In 2012, the Genie and Gemini Awards merged to become the Canadian Screen Awards. Fast forward to today the CSA honour talents in film, television, and now digital media. The Canadian Screen Awards Television and Digital Media Gala 1 was hosted by the hilarious actor and comedian, Sean Cullen. At the gala, Helga Stephenson, (CEO of the Academy of Canadian Cinema and Television) spoke to the audience about the scope of the awards involving 300 categories, 400 jurors, and 1500 nominees. The gala had a performance by the children’s choir of the Regent Park School of Music. Musician George St. Kitt orchestrated the CSA house band. Gala 1 honoured news, sports, reality and all non-fiction categories. Gala 2 honoured drama, children’s, comedy and variety shows. It was hosted by comedian Steve Patterson. #AcademySocial was held for the third year and honoured social media and digital innovators. The awards were hosted by Jus Reign (Jasmeet Singh) – Much Digital Creator/YouTube Influencer and Much and eTalk Daily Host, Liz Trinnear. Guests had the chance to reenact Drake’s Hotline Bling video in the Much digital booth. There was also a live tattoo artist working art on attendees. The cast of the YouTube web series and CSA winner “Carmilla” were in attendance at this year’s #AcademySocial along with Film & TV Actress, Naomi Snieckus (Mr.D). Gala 3, which took place on the last day f the Canadian Screen Week at the CBC, was the 2016 CANADIAN SCREEN AWARDS‘ live broadcast gala and was hosted by comedian Norm Macdonald (one of Canada’s funniest comics). During the two-hour broadcast, 39 CSAs were given out. Among the presenters of the awards that evening were the adorable Jacob Tremblay, Donald Sutherland & Rossif Sutherland, Christopher Plummer, Emily Vancamp, Joe Mimran, Giacomo Gianniotti, Aunjanue Ellis, Stephan James, Brittany LeBorgne, Shailyn Pierre Dixon, Wendy Crewson, and the cast of This Hour Has 22 Minutes. Eugene Levy gave a touching tribute to his lifelong friend, Martin Short and presented Short with the well-deserved Lifetime Achievement Award. Special Golden Screen Awards were given to Corner Gas: The Movie for TV Drama / Comedy, Amazing Race Canada for TV Reality Show, and Snowtime! for Feature Film. Murdoch Mysteries’ Yannick Bisson won the Fan’s Choice Award and was very gracious in his speech. Schitt’s Creek brought home a few awards including the “Best Comedy Series”, Eugene Levy’s “Best Performance by an Actor in a Continuing Leading Comedic Role”, and Catherine O’Hara’s “Best Performance by an Actress in a Continuing Leading Comedic Role”. 19-2 won the “Best Dramatic Series” and Vikings was named the “Best International Drama”. The Orphan Black crew also earned a couple of awards with Ari Millen and Tatiana Maslany’s best performances in their continuing leading dramatic roles. The Book of Negroes took the “Best TV Movie or Limited Series” award and Sunnyside was recognized for its best performance in the variety or sketch comedy shows category. ROOM was given the “Best Motion Picture” award and was rewarded for several things including Emma Donoghue’s adapted screenplay, its achievements in direction (Lenny Abrahamson), art direction, editing and makeup. Performances by Brie Larson (leading role actress), Jacob Tremblay (leading role actor), and Joan Allen (supporting role) also added a few more. and music (Original Score), and Hyena Road for its achievements in visual effects, sound editing and overall sound.